From January 2019, we will require all new and renewing members to read and understand some documentation that will ensure we are all aware of the risks associated with rowing, and what we need to do as club members to reduce these risks. Rowing Qld has also developed 2 courses on water safety, that is particularly relevant to rowers. They can take up to an hour to complete, so give yourself enough time to understand the concepts and detail in each course for your own benefit. Do these courses! The link to these courses is here: http://learning.rowingqld.asn.au/ Just select the Rowing Qld Safety Course 1. Brisbane River and the Rowing Qld Safety Course 2. All Areas They are free to do. The links appear to be a bit broken in December 2018. RQ will advise when these links are working again. 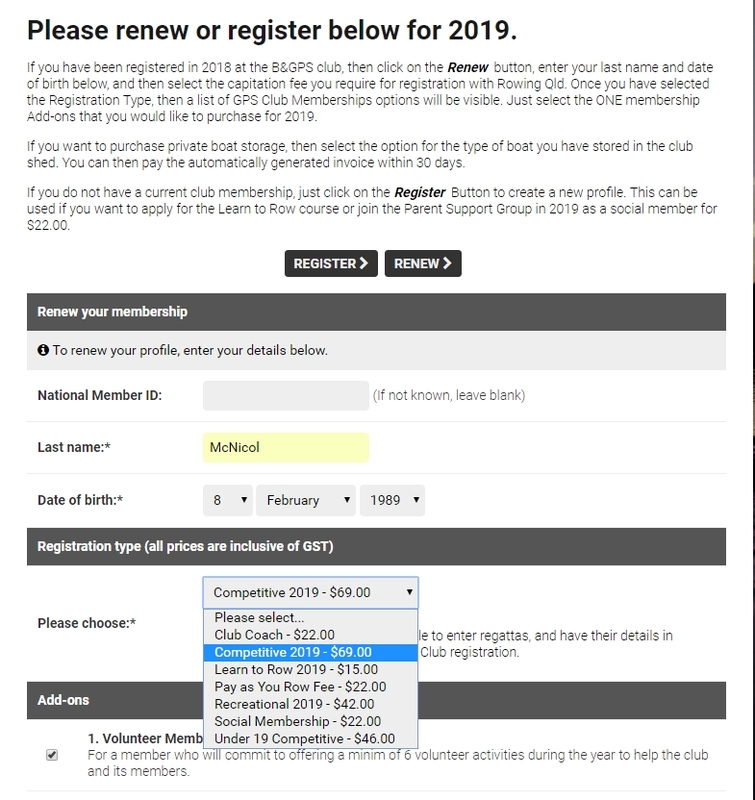 When you have completed the steps above, you can renew your 2019 membership in the box at the bottom of this page. If your details in Revolutionise are incorrect, then we will not be able to contact you. If you have not registered in Revolutionise, you will NOT be able to enter into Regattas in 2019. 1. Below is an example of the renewal procedure. Click on the following link Membership Renewal to complete this process for your own registration. Once you enter your name and DOB, you can select the type of RQ Registration you require. Options are mainly Competitive or Non Competitive. You will then need to ADD club membership charges of volunteer annual membership or non-volunteer for 2019. 2. 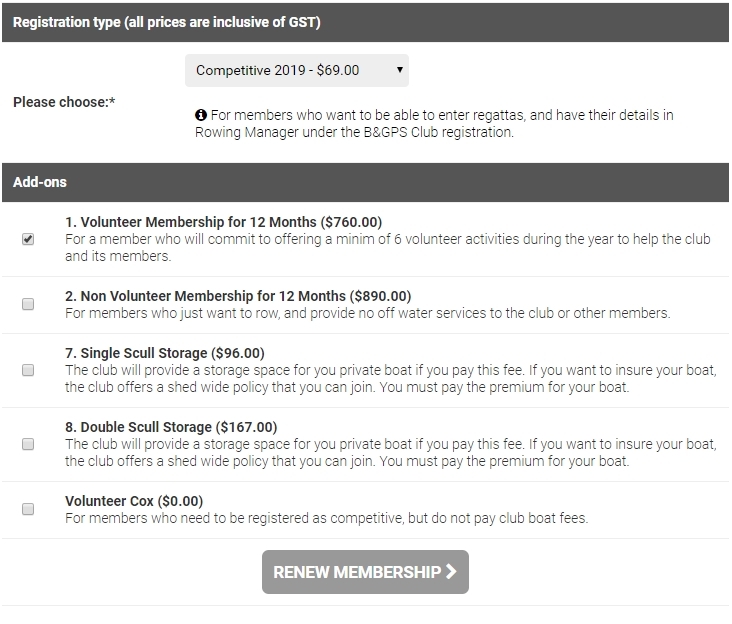 Now select what type of Club Membership you require, and if you want any extras such as boat storage. 4. 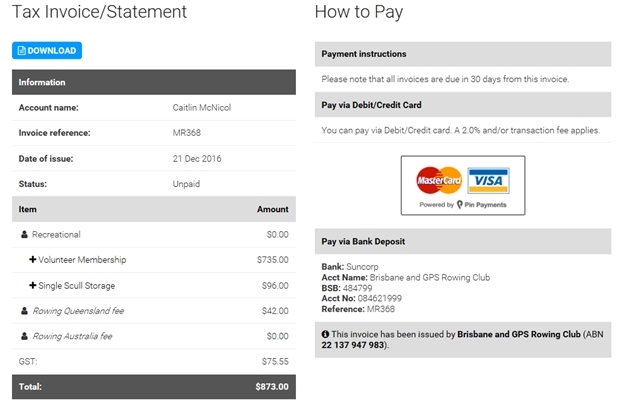 This will generate an invoice associated with your registration type which will be emailed to your registered email address. Please check your ‘junk’ folder if you do not receive this invoice. Please ignore the note about the 2% credit card fee. That fee is not passed on to you on the final invoice. 6. Please make payment via credit card from the invoice that is emailed to you after you have renewed your membership. When you have done all of that …. Welcome to another year of rowing at Brisbane & GPS Rowing Club. We hope you have many wonderful rows and lots of great water. If you are joining part way through the year or would like a quote for family membership please contact the club for membership fees prorated over the course of the year. Memberships are due and payable by the 31st January 2019 at the latest. Please complete the registration process above with the appropriate payment to the Club by no later than 31st January 2019. If you have any queries about your renewal or what fees to pay (particularly if you have a family membership), please do not hesitate to contact the club by emailing the Club Administration here. 2019 Limited: Specifically for people participating in a rowing program with a limited time-frame, for example, Learn to Row or Corporate rowing. Limited registration lasts for 3 months after the initial registration, and does not allow participants to compete in regattas outside of those specific to their rowing program. Cost: $15.00.